The title of my post is of course, debatable. It's simply impossible to name one grape as the greatest. Just to my own way of thinking, there are times when I think the finest grape is Gewurztraminer or perhaps I go with a red variety such as Pinot Noir or Nebbiolo. Others maintain that Riesling is the world's finest and you won't find much of an argument from me on this matter. But I'm going with Sauvignon Blanc, if only for the fact that there are so many great examples from so many corners of the globe. Of course, the Loire Valley in France - especially with the marvelous examples of Sancerre and Pouilly Fumé - is the reference point for this variety. Then you have Marlborough Valley in New Zealand with its gooseberry-laden versions; another great Southern Hemisphere zone for Sauvignon Blanc is the Leyda Valley in Chile - truly underrated wines! California has some lovely examples from Sonoma and Napa that of course, take a back seat to the more renowned reds produced there, while South Africa is home to some notable Sauvignon Blancs that are truly vibrant. Let's not forget northern Italy, especially in Friuli and Alto Adige and there are also some expressive Sauvignon Blancs from Australia as well. So I'll be celebrating the world's great Sauvignon Blancs in this three-part series, with this initial post focusing on France, with the remaining two posts dealing with California/Washington and then the rest of the world (New Zealand, South Africa, etc). There are several varieties that perform well in numerous countries, but I honestly don't think there are as many complex, beautifully structured wines from so many places as there are with Sauvignon Blanc. 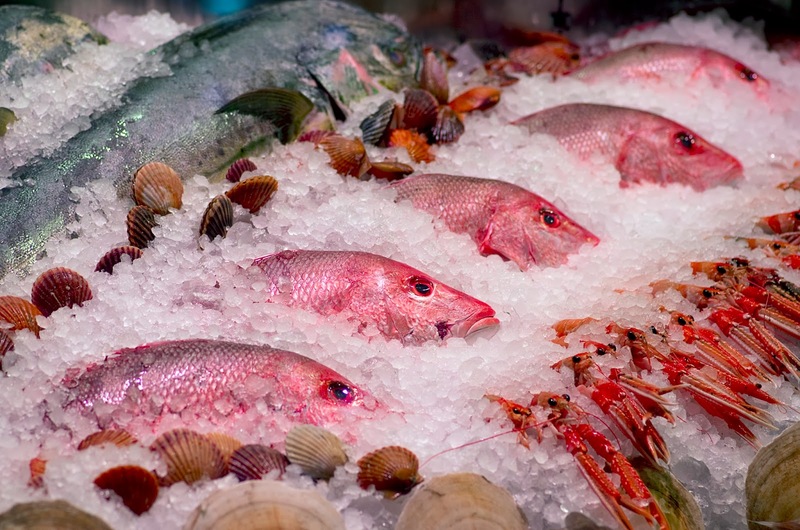 So on to France and its beautiful examples of this great variety. 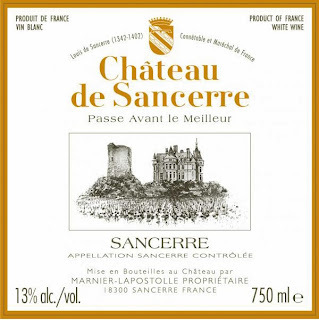 Mention Sancerre and Pouilly Fumé to wine lovers and there is an instant connection with the Loire Valley and the Sauvignon Blanc grape. These are the two most famous versions of this variety in the Loire and all of France and they care certainly among the most celebrated versions of this variety anywhere in the world. These two appellations are at the furthest eastern reaches of this region in eastern Central France (as a reference point, the Muscadet zone is situated at the western edges of the Loire Valley, near the Atlantic Ocean). I find that these two wines are quite different in character, with Sancerre often being a cleaner, more "pure" expression of Sauvignon Blanc with Pouilly Fumé being a bit more aggressive in the aromas (Fumé means "smoky) and in the finish. 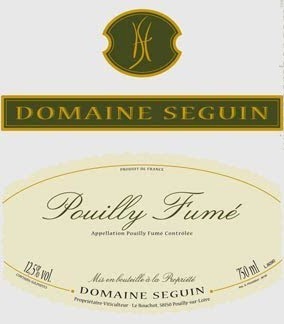 While both offer traces of minerality, it is Pouilly Fumé that for me, has a more distinctive note of this trait, along with more of a wet stone nuance in the aromas. Depending on the vintage and producer, the best versions drink well for 5-7 years, though some lighter versions need to be consumed earlier, while other more powerful versions can drink well a decade after their release. 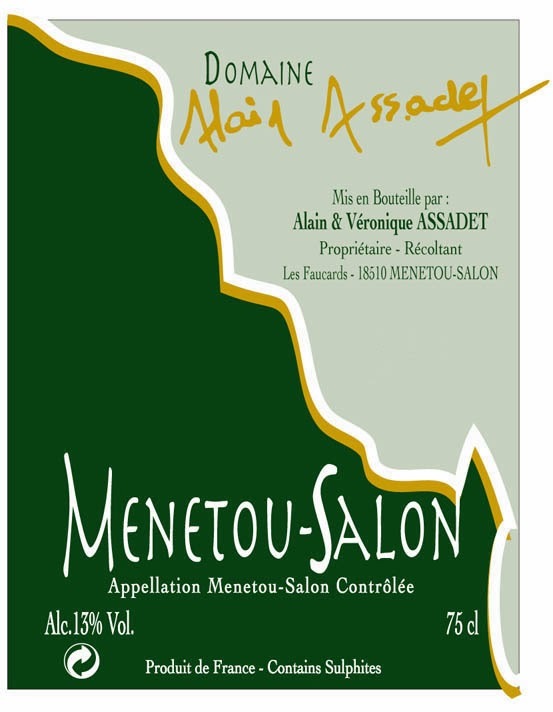 Other Sauvignon Blanc appellations in the Loire Valley include Menetou-Salon, Quincy and Touraine. These wines are not seen much outside of France, but there are a few importers bringing in these wines to America. I recently tasted very fine versions of all three (notes below); each has its own unique set of characteristics and make for a fascinating comparison of how Sauvignon Blanc performs in the Loire. There are a few other areas in France where 100% Sauvignon Blanc wines are made (please note that I am not including Bordeaux in this study of the variety, as most of those wines are actually blends of Sauvignon Blanc and Semillon - lovely wines, but quite different). In the western Rhone Valley, the appellation of Cévennes is home to medium-bodied, very distinctive 100% Sauvignon Blancs that fly under the radar. A bit south of Bordeaux in the Southwest-Armagnac region, Sauvignon Blanc is one of several white varieties planted here; these are medium-bodied, elegant versions of Sauvignon that are simple and direct, offering very fine varietal purity. Tasting notes (in order of suggested retail price; the first two wines are outside of the Loire Valley, while the final wines are all from the Loire). Light yellow; aromas of Anjou pear, chalk, wet stone, chamomile and a touch of eucalyptus. Medium-full with very good concentration. Richly flavored finish with very good acidity, a subtle note of minerality and notable persistence. Enjoy over the next 2-3 years. Excellent value at $17. 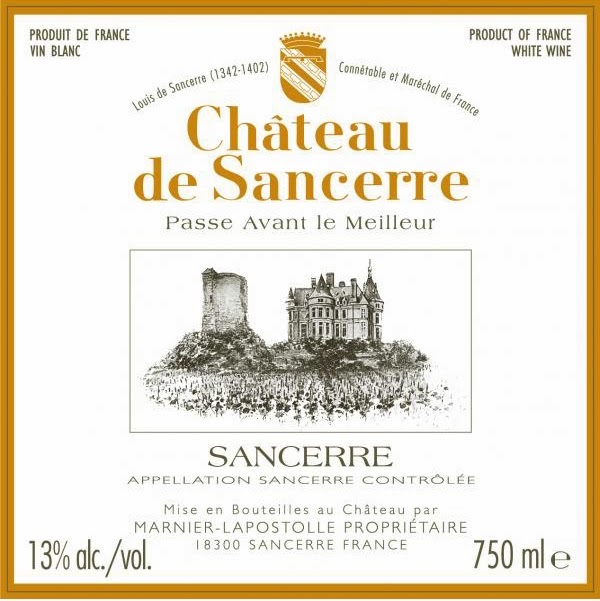 2012 Thomas & Fils Sancerre "Les Creles"
I used to really like Zinfandel, once upon a time. In fact, there would occasionally be a bottle I would love. I can't say that it was ever my favorite variety, but there was much to admire about this gutsy wine. Trouble was, Zinfandel became pretty boring to me. I'm sure some of this had to do with me moving towards Italian wines, which in most cases offer higher acidity, red or white. But it also had to do with the prevailing winds in California during the 1990s and even to this day, to some degree. This big wine became a bear, often wild and untamed in its approach. Alcohol levels, which were high to start with - simply became unacceptable as far as serving this wine at the dinner table. Yes, proper ripeness for a Zinfandel in warm climes in California - 15% and 15% were standard - soon inched up to 16%, 16.5%, even 17% in some cases, as new strains of yeast had been developed to make this possible. Clearly, bigger is better was the mantra for Zinfandel (and a lot of Cabernet Sauvignons, but that's a story for another day); of course, as these higher alcohol wines were flashier and often resulted in higher scores from a few influential wine magazines, it because a situation of follow the leader. Well, I stopped following. So how nice to report that not every producer of Zinfandel in California went that way. Last week, I tasted two new releases from Dry Creek Vineyards in Healdsburg, in the heart of Sonoma's Dry Creek Valley. The two wines were the 2011 Heritage Vines Zinfandel (Sonoma County) and the 2011 Old Vines Zinfandel (Dry Creek Valley). The common theme in these wines were older vines and not percentage of alcohol or intensity; clearly the Dry Creek Vineyard folks have their priorities straight. The Heritage Clone story is a marvelous one, in that winery owner David Stare (he founded DCV in 1972 when Dry Creek Valley was little more than prune orchards and a few family farms) grafted old-vine budwood onto new rootstock, thus giving new plantings the foundation or "heritage" of classic old vine Zinfandel. The first vintage of this Heritage Clone Zinfandel was 1997; the wine is now known as Heritage Vines Zinfandel. My tasting notes describe perfumes of raspberry, black cherry, tar and anise - classic stuff! Medium-full on the palate, the tannins are medium-weight (thank you!) and the oak is well integrated (thank you again!). The wine has very nice varietal character and impressive balance; as you drink this, you don't get the idea that you're being hit over the head. No, this is about pleasure and what a nice food wine this is, be it pastas with marinara or bolognese sauce, grilled ribs or even pizza. By the way, this wine tasted even better the second and even the third night. At a suggested retail price of $19, this is an excellent value. As for the Old Vines Zinfandel from 2011, the front label has text that reads "Vine Age - 90 years plus." I think it's great that it's right there upfront for the consumer to see and I like the fact that the principals at the winery - first Dave Stare and now his daughter Kim and son-in-law Don Wallace - have always tried to emphasize the "old" in old vine. This term is not legally defined in California, so old, as far as vine age, is whatever the winery chooses to call it. Stare was always pushing for a definition of this - he wants old vines to refer to plantings that are at least 50 years of age - and anyone who's tasted a Zinfandel made from vines that are at least a half of a century old knows the character that age can bring to the wine. The 2011 Old Vines Zin (83% Zinfandel and 17% Petite Sirah, basically the same blend as in the Heritage Vines Zin) has aromas of blackberry, prune (typical of very old vines) and purple iris. Medium-full, this has an elegant finish with medium-weight tannins and balanced acidity. This is a wine of restraint - notice a theme here for Dry Creek Vineyard Zinfandels? - and again, a lovely wine for food (pork roast would be ideal); enjoy this over the next 5-7 years. This is a more limited production, as you might imagine, so the price is higher (the yield is an incredibly small 1-2 tons per acre! ), but at $30, you're getting your money's worth as far as quality and you're drinking history! Keep up the good work at Dry Creek Vineyards, everyone! We need more refined Zinfandels such as these! Note: One final story. I go back quite a few years with Dave Stare, meeting him in the mid-1980s in Chicago at a distributor where I sold his wines. I always liked Dave's slightly irreverent style, as he never took himself too seriously and often drew attention away from himself, directing it to his wines or his team at Dry Creek that helped him craft these products. One of my favorite memories of him (and for many of us in the wine business in the 1980s) was a television commercial Dave did for Augsburger beer, a wonderful Midwestern brew (sadly, no more) made in a classic pilsener style. I don't recall all the details, but in the ad, he was introduced and asked to speak about the beer in wine terms. He held up a glass, inhaled the aromas and declared, "Hops dominate the nose." Great stuff and pure Dave Stare! 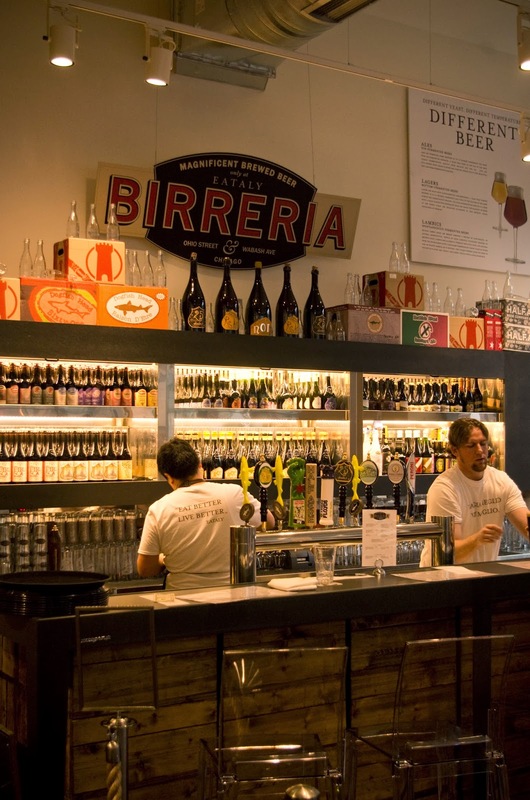 Eataly, the one-of-a-kind market about all things Italian has arrived in Chicago! 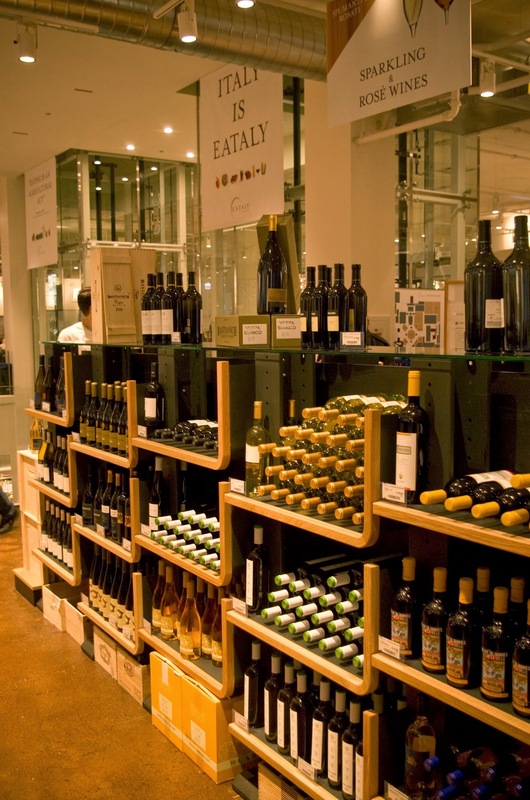 This store, which gives consumers a chance to purchase the finest Italian wines, cheeses, oils and many other specialty foods, was the vision of Oscar Farinetti, who opened the first Eataly in Torino in 2007; there are now ten in Italy, including one in Rome, Bari, Milan and Bologna. There are 13 in Japan, even one in Turkey and Dubai. 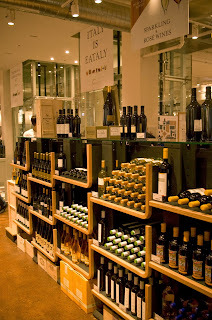 New York City was home to the first Eataly in America and as of December 2, Chicago is now the second. This new store is huge, some 63,000 square feet, which is more than 10,000 square feet larger than New York. The wine selection is great, as you would imagine with a great cross section of Italian wines, from Prosecco - and several other lesser known Italian sparkling wines - to famous reds such as Barolo and Brunello along with many excellent reds and whites from Campania, Lazio, Abruzzo and vitually every region in Italy. 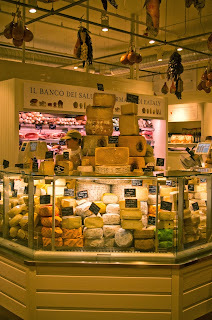 And if you're like me and adore artisanal cheeses, this is the store for you. 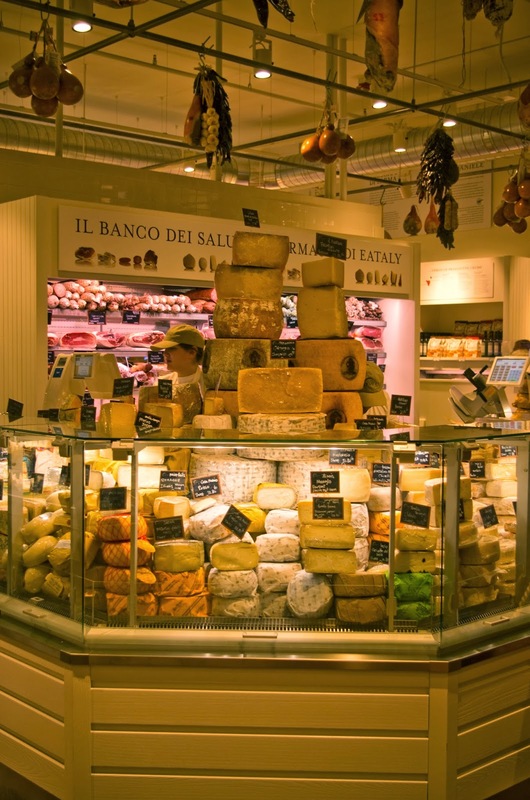 I've never seen such a great array of Italian cheeses - be they famous such as Grana Padano or more of a hidden gem such as Toma from Piemonte (the Toma D.O.P that I purchased was great!) - and there are also many excellent examples from American cheese makers as well. 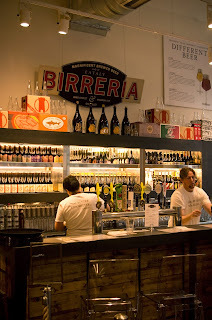 So whether you want to just have an espresso or pizza or you want to purchase some incredible meat, seafood, pasta, cheese, wine, beer, biscotti, etc, etc, etc, Eataly is highly recommended. Get in there! I absolutely love the wines of Alsace and believe that this is the finest collection of white wines in the world; taking into mind the whites from Burgundy as well as Friuli, Alto Adige and Campania in Italy, that's a strong statement, but one in which I'm convinced. Add to that the marvelous array of wines, from Pinot Gris to Riesling to Gewurztraminer as well as a few others (including one red, Pinot Noir) and you've got a collection of wines that can pair up beautifully with a wide range of foodstuffs. 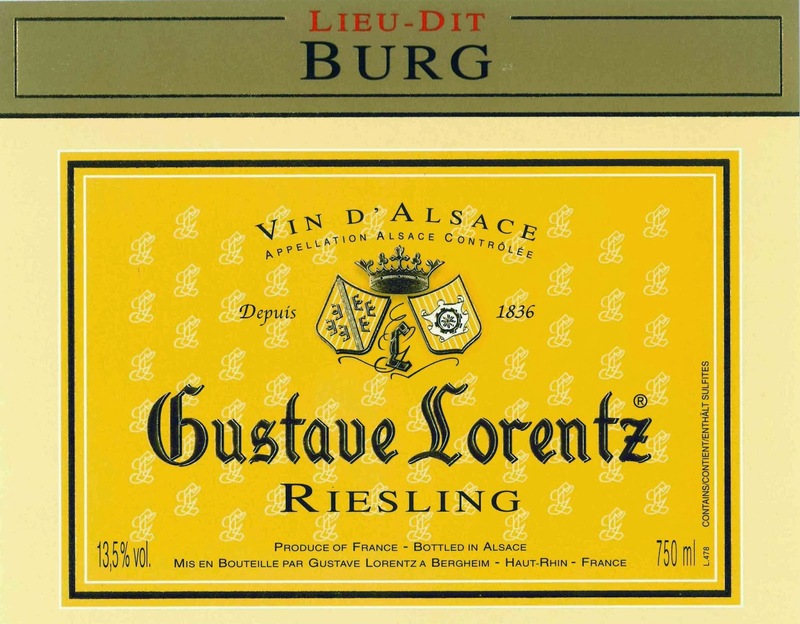 Recently, I tasted through the wines of Gustave Lorentz, an excellent producer situated in Bergheim near the foothills of the Vosges Mountains. The family has been producing wine there since 1836 and today is managed by Georges Lorentz, sixth-generation vintner. They own a total of 85 acres of vineyards of which 34 are Grand Cru, with four at Kanzlerberg and thirty at Altenberg de Bergheim. In 2012, their vineyards were certified organic by Ecocert. I've tasted a few entry level "reserve" wines from Lorentz over the years - quite often the Pinot Blanc- and have been very happy with the overall balance as well as the typicity of the products. They represent Alsace well and they're also fine values, with the Pinot Blanc coming in around $16 a bottle (sometimes even less). "Delicate yellow, fine perlage; aromas of golden apple peel and a hint of lemon custard. Medium-full with very good concentration. Nicely balanced, very good acidity and very good persistence. Well made, this is a very flavorful cremant that is quite dry; it is also one of the nicest I've had in some time. Enjoy over the next 2-3 years." I enjoyed this with turkey and the Thai food; it worked well with both, as the acidity and cleanliness of this wine cut through the spice of these foods. The suggested retail is $25. Lorentz also produces a very nice rosé, made entirely from Pinot Noir. This has a beautiful strawberry color with fresh watermelon and strawberry fruit, very good acidity and impressive depth of fruit. This is quite dry and nicely balanced. It also worked well with turkey (with gravy) and an array of Thai dishes. The suggested retail is $16. Three other wines that are of excellent quality are the 2011 Gewurztraminer "Reserve", the 2007 Pinot Gris "Schofweg" and the 2008 Riesling "Burg". 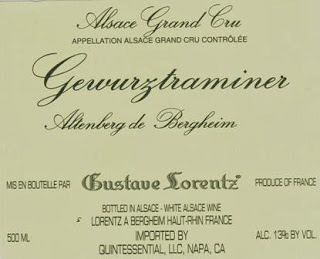 Gewurztraminer is a specialty in Alsace and it's always been a favorite of mine; this 2011 from Lorentz with its exotic lychee, pineapple and lemon tea aromas and dry finish is first-rate and a wonderful partner for all of the foods I've mentioned in this post. Enjoy this over the next 2-3 years; suggested retail of $25, which is quite fair. The 2007 Pinot Gris from a single vineyard (an extension of Altenberg) offers inviting flavors and aromas of red apple and oragne peel backed by impressive depth of fruit and a lightly spicy finish; this was especially nice with Thai curry. This has the concentration to drink well for another 5-7 years; this is a delightful wine with a suggested retail of $30. The 2008 Riesling "Burg," also from a single vineyard, is medium-full with lovely aromas of petrol and apricot (classic for this variety); the finish is long and very dry. 2008 was an excellent vintage in Alsace with expressive aromas and very good natural acidity; though not a year that produced the "biggest" wines, 2008 in Alsace yielded wines of beautiful varietal purity and structure. This is superb at present with pork and lighter game and white meats and should drink well for another 3-5 years, though I may be a bit conservative in that estimate. Riesling is certainly a hallmark of any Alsatian producer's portfolio and this is one that the Lorentz family should be proud of; suggested retail is $30. 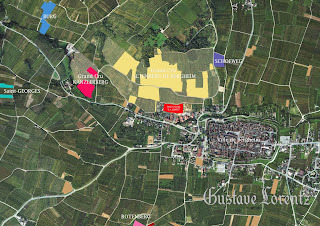 Finally, let's talk about the 2006 Gewurztraminer from the Altenberg de Bergheim Grand Cru vineyard (depicted in the above map). 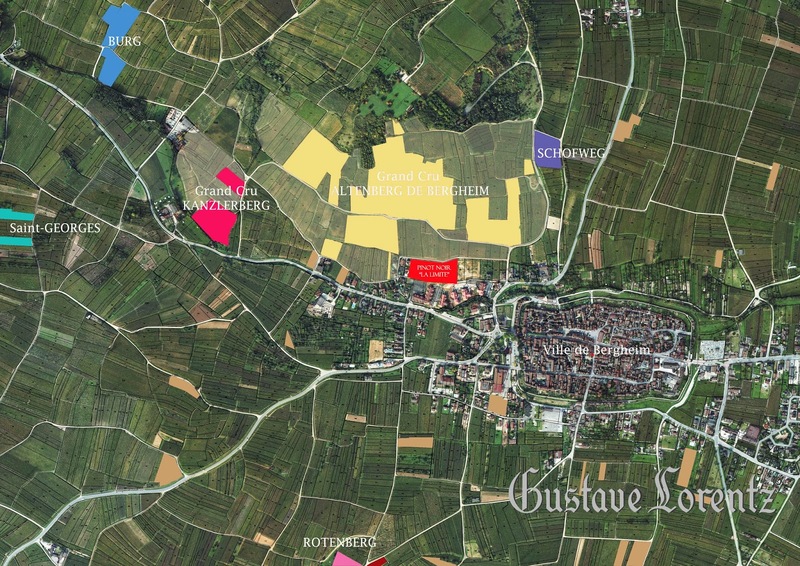 The Grand Cru appellation in Alsace was certified in 1975 with many of the first vineyards being designated as such in 1983; there are a total of 51 Grand Cru vineyards in Alsace. Altenberg de Bergheim, located a bit north of the town of Colmar in the Haut-Rhin ("Upper Rhine") section of Alsace is considered an exceptional site for Riesling and Gewurztraminer. The Gustave Lorentz 2006 Gewurztraminer Grand Cru Altenberg de Bergheim is clearly a wine of great breeding, as you would expect. Light golden yellow with sumptuous aromas of lychee, apricot, mango and white roses - just this description alone makes me want to try this wine! - there is a richness and lushness, even an oiliness on the palate. Full-bodied with outstanding persistence and excellent acidity with ideal ripeness, this is a superb wine; my dining companion at the Thai restaurant (whose name was not Gustave) called this wine a "show stopper" and I heartily agreed. This is so delicious on its own, but it would be a shame to not pair this wine with food; this is perfect with Thai pork or chicken or even duck, while it would show off turkey and lighter game beautifully and would also be ideal with foie gras. This is such a unique wine for so many reasons; it has great complexity and power, yet it is always in balance, while the varietal purity is spectacular. This should drink well for another 7-10 years and the suggested retail price of $50 is quite fair, considering where this wine is from as well as its limited production. Tasting through a lineup of wines such as these is a great exercise in discovering what the wines of Alsace are all about. 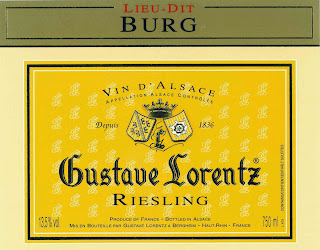 Being able to experience such first-class offerings from Gustave Lorentz merely reinforced the marvelous quality of this renowned family producer. The wines of Gustave Lorentz are imported by Quintessential Wines, Napa, CA. A few weeks ago in Chicago, just before the wonderful Champagne tasting hosted by the Comité Champagne (read my post here), I was a guest at a small lunch hosted by this group. The purpose of this lunch was to discuss current trends in Champagne; the featured speakers were Jean-Marie Barillère and Thibaut Le Mailloux of the Comité as well as Sam Heitner of the Champagne Bureau, USA. The discussion went back and forth and the guests (primarily media) were allowed to ask questions and state their opinions; this was a nice change from the usual approach where one speaker talks and everyone listens. How nice to have a free flow of ideas! Since 2008, there has been a slight decline in sales. This is due of course to the worldwide economic crisis. Sales were better in 2009 than in 2008. Lately there has been a decline in sales in France and England, while sales have been steady in Italy. There has been a slight increase in Germany and Scandanavia, while the biggest increase over the past few years has been in Japan, especially with younger women (30s and younger). The Comité is taking even stronger steps to protect the Champagne name, as they are still upset by inexpensive sparkling wines from California labeled as Champagne. There are 15,000 growers in the Champagne district, 4651 grower/producers, 143 cooperative producers and 349 houses. If you purchase more than 5% of your grapes, you are considered a house. To show you how popular Champagne is, this product represents 30% of France's wine exports, yet Champagne makes up only 4% of the country's vineyards (and .4% of the world's vineyards). I'd say they're doing something right when it comes to marketing and selling Champagne, wouldn't you? Champagne in Chicago - Magnifique! On Tuesday, October 29, the Comité Champagne (Champagne Bureau) held a tasting in Chicago with 36 Champagne producers pouring three of their finest cuvées for the trade. Well-organized and attended, this was an outstanding tasting that offered great evidence not only of the amazing quality of Champagne but also the marvelous diversity of these products. As the USA Champagne Bureau noted, this was their first official tasting in Chicago and only the fourth one held in the United States. As I commented to Sam Heitner, director of the Bureau, they need to come back more often! To be able to taste so many superb wines from a mix of famous and lesser-known producers was not only a treat, but also a great educational experience. I can't imagine that the members of the trade that attended this event are not going to come away with a greater appreciation of Champagne; I also have to believe that many of them are also going to purchase several of these wines for their restaurants or retail outlets. I could write volumes about this event, but for now, I will comment on some of the finest wines I tasted (of course, I didn't taste everything, so I imagine that I missed quite a few other first-rate wines). Best Blanc de Blancs: Gosset Grand Blanc de Blancs - Hands down, the finest Blanc de Blancs I tasted at this event. One thinks of Blanc de Blancs as a wine of finesse, not power. Yet here was a 100% Chardonnay that was a wine of deep concentration, perfect ripeness and marvelous structure that was among the most full-bodied of the tasting. Lovely now, this will peak in 7-10 years. Most Distinctive Cuvée: Drappier "Quattuor": This had to be the most distinctive wine at the tasting, if only for the blend of grapes in this wine, 25% each of four white varieties (yes, you read that correctly, four white varieties): Chardonnay, Petit Meslier, Blanc Vrai (Pinot Blanc) and Arbane. (Please read my recent post about varieties in Champagne; while most people believe there are only three approved varieties for Champagne, there are actually seven). This "Quattor" is a Blanc de Blancs - interestingly enough, a Blanc de Blancs that is not 100% Chardonnay; believe me, there are not many others! Offering powerful yeasty aromas as well as notes of apple, pear and honey, this is a rich, very complex wine with excellent persistence and beautiful acidity. This will be at its best in 5-7 years; I imagine this would be especially wonderful with lighter game or many veal preparations. Best Non-Vintage: Pol Roger "White Label", Bollinger "Special Cuvée" and Lamiable Brut Grand Cru: Like a treasured friend, the Pol Roger "White Label" is something you can count on again and again; the richness and impeccable balance of this wine are striking. Offering tons of flavor, perfect harmony and beautiful finesse, the "Special Cuvée" from Bollinger is underrated, as everyone looks to their more expensive wines, but this is first-rate, with outstanding depth of fruit. The Lamiable offers dried pear and tropical fruit along with a nice plummy character (this is 80% Pinot Noir). It also has a lovely mineral character in the finish. Let's Hear it for the Côte des Bars! 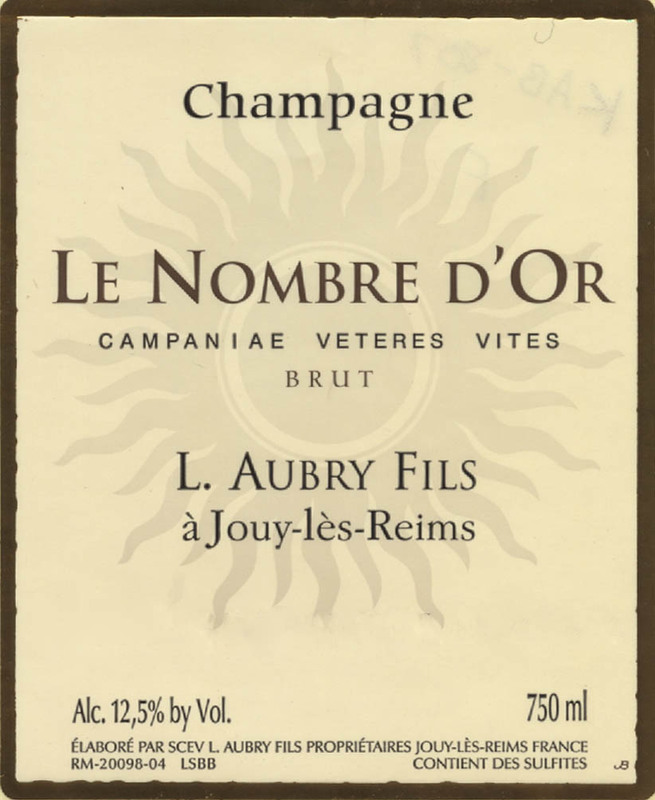 - While many of the most famous Champagne producers are from the celebrated zones of the Montagne de Reims or the Côte des Blancs, let's not forget that there are some marvelous Champagnes being produced in the Côte des Bars - aka, the Aube - the most southern of the growing zones in Champagnes. The soils are quite different here, often resulting in expressive wines with a distinct earthiness. At this tasting, the wines of Devaux from this zone were quite notable and definitely among the most harmonious that I experienced. In particular the firm's Millésime "D" 2005 was one of the most memorable of the afternoon. A 50/50 Chardonnay/Pinot Noir blend that spent seven years on its own yeasts, this has a long, long finish that displays great persistence and distinct minerality. This producer should be better known; given the quality here, perhaps the Côte des Bars should be given more consideration by Champagne lovers. 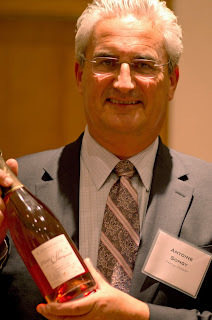 Best Rosés: Duval-Leroy "Prestige" Premier Cru; Pascal Doquet, Premier Cru; Pierre Paillard "Les Maillerettes"and Lamiable Grand Cru: I love Rosé Champagne so much (what's not to like? ), so I'm like a kid in a candy store when there are so many excellent versions of Rosé offered at an event such as this one. Each of these wines has power, ideal ripeness and excellent persistence. While the styles differ - expressive minerality in the Paillard, great depth of fruit in the Duval- Leroy, distinctive flavors in the Doquet and a strong plummy character in the Lamiable, these are all first-rate examples of Rosé Champagne (note: the rosés from Thénoit, Taittinger (Prestige Rosé) and Louis Roderer (2008) were also quite lovely). Best "Great" Producer that is relatively unknown: I do my best to stay current on the finest houses and growers of Champagne but of course, as there are so many producers, there are always going to be some I don't hear of or have the opportunity to taste their wines. Yet even with all that, I'm amazed that I'd never had the wines of Pierre Paillard from the town of Bouzy, home to some of the finest Pinot Noir vineyards in all of Champagne. 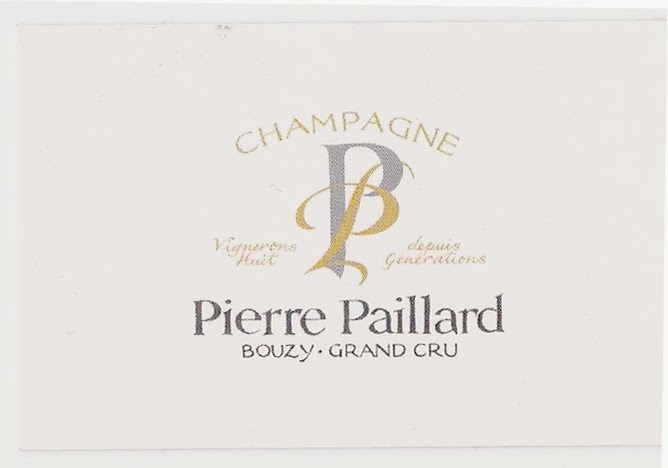 Each of the three wines of Paillard poured at this tasting - the Bouzy Grand Cru, the Bouzy Grand Cru 2004 and the Rosé "Les Maillerettes" (mentioned above) are all from Grand Cru vineyards. These wines certainly have the power and complexity you would expect given their notable origins, but these cuvées exceed their distinguished breeding, as they display distinct minerality and are exceptional evidence that terroir can exist in Champagne, a notion often dispelled by many observers. This is an outstanding producer! 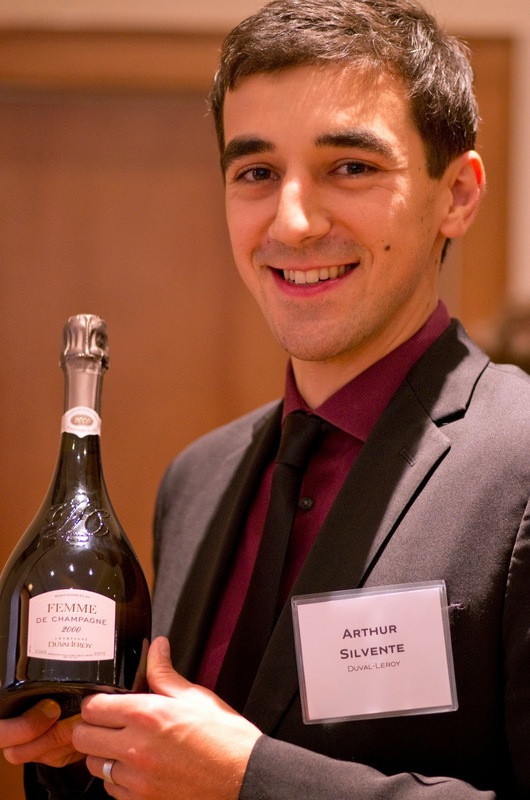 Best Wines: Duval-Leroy "Femme de Champagne" 2000; Phillipponat "Grand Blanc" 2004; Nicolas Feuillatte "Palmes d'Or" 2002 - Again, there were dozens of first-rate wines at this event; however, there were three that stood a level above the rest. The "Palmes d'Or" from Feuillatte is all about power; while this wine needs a lot of time to display its best, it is already a remarkable offering from the finest vintage of the decade in Champagne. The "Grand Blanc" from Phillipponat is a stellar wine, truly one of the finest Champagnes I have ever tasted. 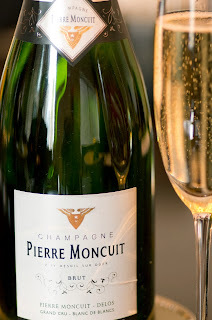 Powerful with outstanding complexity and persistence, this is what a great Champagne is all about and it is certainly one that you recall even days after you taste it. 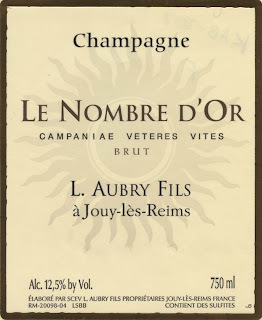 Finally there is the sheer perfection of the Duval-Leroy "Femme", the firm's tête-de-cuvée. The 2000, a blend of 95% Chardonnay and 5% Pinot Noir, was vinified in oak, which gives the wine an added richness on the mid-palate; combined with the tremendous depth of fruit, this results in a flawless wine, one of exceptional power and elegance at the same time; this is a Champagne that is simply unforgettable. Duval-Leroy has become one of my go-to houses for great Champagne; this is certainly one of the finest wine producers in the world. A big thank you to the Comité Champagne for their skill and hard work in organizing this tasting. Also thanks to the producers that participated and shared their wines and knowledge and finally, thank you also to my friends who attended this event and shared their preferences - many of you alerted me to some great wines I would have otherwise not have tasted. I can't wait until the next Champagne tasting in Chicago - unless I make it to Champagne first! One of the best days for an Italian wine lover is coming! The Simply Italian Great Wines tour is returning with stops in Chicago on October 28 and Los Angeles on October 30. This is a day for every Italian wine fan in the trade and media. There are several seminars as well as a grand tasting of wines from numerous regions in Italy, including Friuli, Piemonte, Tuscany, Umbria, Veneto and several others. I've been involved in this event for the past several years and again, I'll be teaching seminars in Chicago, specifically on Umbria and then Piemonte. There will also be seminars on the wines of the Veneto as well as Chianti Classico and also one about "Regulating Italian Wines in Today's Market." These seminars will be presented both in Chicago and Los Angeles. As they fill up quickly, it's recommended that you sign up right away. Again, these events are for the trade and media only. To sign up, email Jessica Celona at info@ieemusa.com (phone 305-937-2488) or click here. Hope to see you on the 28th (or 30th) for a great day of Italian wines! Conventional wisdom about anything - automobiles, movies, sports - can be a tricky thing. Usually that information is true, or at least accepted as true. I won't get into the misinformation that clogs up the internet these days - I could write all day on that topic. Take Champagne for example, when it comes to universal truths. 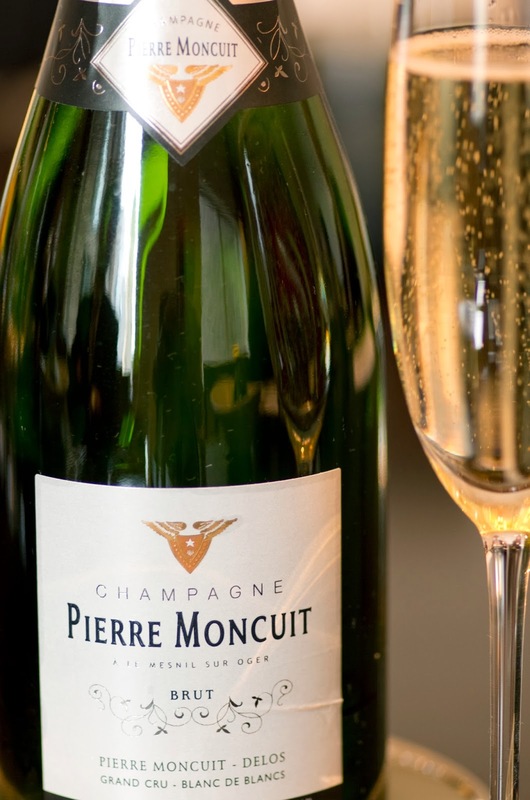 We all know that an authentic Champagne - produced from grapes grown in the Champagne district of France - can be made from three grape types, namely, Chardonnay, Pinot Noir and Pinot Meunier. That's a fact that everyone knows - right? Well it turns out that there are actually seven varieties permitted in the production of Champagne. It's just that you don't hear about the other four as only a handful of producers use these other varieties. Then consider that these four varieties account for approximately 1% of the total planting in Champagne and you can understand why these varieties are rarely discussed. Still, they exist and here they are listed: Pinot Gris (also known as Fromenteau or Enfumé), Arbane, found only in the Aube district, Pinot Blanc (also known as Blanc Vrai) and Petit Meslier. They're all white varieties by the way, so that means there are a total of five white varieties that can be used in Champagne (Chardonnay, of course, being the other) with two red varieties: Pinot Noir and Pinot Meunier. As you might imagine, this is a very distinctive Champagne; instead of the toasty, yeasty notes you find in the aromas of so many Champagnes, this has perfumes of green mint, dried pear, chamomile and even a hint of fig and dried yellow flowers. Medium-full, this is quite elegant and vibrant on the palate and there is a long, satisfying finish with very good acidity and a light earthiness. It's not an austere style of Champagne; it is delicious and extremely well balanced, and of course, displays marvelous complexity. It's beautiful now and should drink well for another 3-5 years - perhaps longer. I may not have been in seventh heaven, but what a stylish Champagne! This post is a little different than others I've written for this blog, as this is a movie review. The movie is a French film called You Will Be My Son (Tu seras mon fils, in French with English subtitles) and it is an excellent drama about pride, tradition and jealousy within an estate in Bordeaux. I saw the film recently in Chicago at the French film festival; I had read a brief writeup in a local paper and noticed the photo above with the vineyards in the background, which peaked my interest. Given the nice review, I knew I had to see it, especially given that the last two feature films I had seen about wine - namely the dreadful Bottle Shock and the boring A Good Year - were tremendous wastes of time. I thought that someone had to make a good movie about wine and You Will Be My Son is just that. The story centers on Paul de Marseul (portrayed by Niels Arestrup, who gave a very touching performance in War Horse), the owner of a prestigious wine estate in Saint Emilion. He is dedicated to his profession and his winery's image and is set in his ways. That means that he will not let his son Martin (Loran Deutsch) handle any of the winemaking chores. He does let him handle administrative duties, such as ordering barrels or hiring workers for the harvest, but that is all. Martin asks his father to let him work in the cellar, especially as he has a degree in winemaking. But his father is not going to give him that opportunity, telling Martin, "You don't make wine in college. You need a nose, a palate. All you have is an ear." 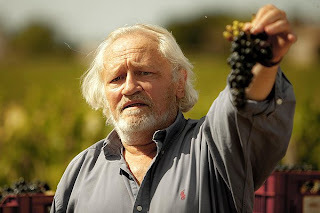 As the grapes are ripening, Paul learns that his estate manager François Amelot (Patrick Chesnais, in a marvelously emotional performance) has been diagnosed with inoperable cancer and has been given only six months to live. Much is made of the cycle of life and death - the ripening of the grapes, the maturation of human life - that is a nice touch in the screenplay written by Gilles Legrand (who also directed the film) along with Delphine de Vegan and Laure Gasparotto. Paul has trusted François for decades and has counted on his expertise at harvest time; indeed he tries to get him to oversee what will be François' last harvest. 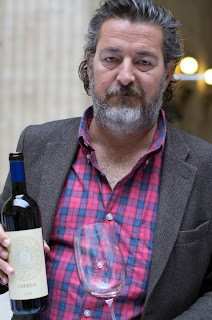 But he is just too ill to do much work, so Paul contacts François's son Philippe (Nicolas Bridet), who is the winemaker for Coppola in Napa Valley to come over and work the harvest and take charge in the cellar during this critical time. 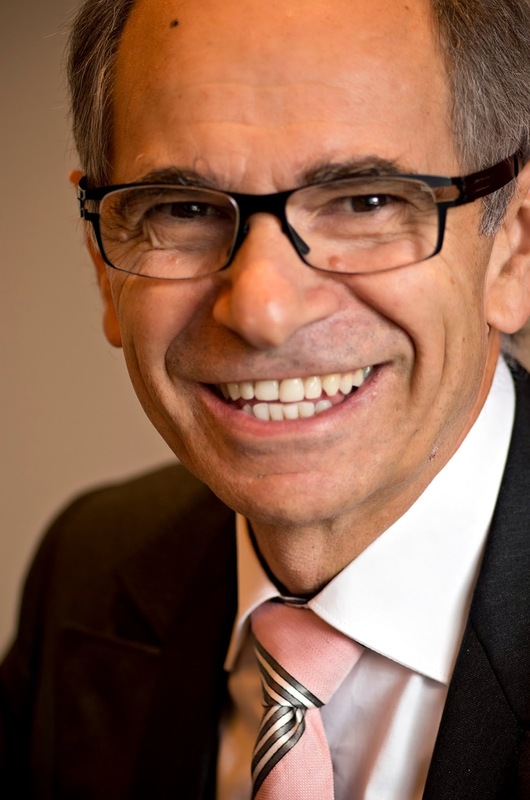 Philippe agrees, which is a big help to Paul, but creates a charged situation with Martin, who believes he should have been given this opportunity. I won't give any more plot details away, except to say that Paul makes more gestures as time goes on to reward Philippe in spite of his own son Martin. Clearly, Legrand must have read East of Eden by John Steinbeck (or seen the Elia Kazan film version), as there is a similar theme here of deprived love and what can happen when a father does not confide in his son. Jealousy rules the day and even Philippe is unsure after a while that he should be the winemaker in place of Martin. The story is nicely organized with multiple layers and these are characters we truly care about - we want to know all throughout the film how their lives will play out. The final act, which comes as an ironic, very somber sequence, is nicely done. Wine drinkers of course, will love the shots of the vineyards with closeups of the grape clusters on the vine. There are also some lovely scenes in the cellar, where we see Paul pull out a few older treasured bottles as well as open his heart, as he tells of some past secrets. In vino veritas, indeed! This is a wonderful film that I highly recommend. It opens on August 16 in Los Angeles and New York City. Here is a link to the trailer. There are some who will tell you that Riesling is the world's greatest wine grape. I may opt for Sauvignon Blanc or Pinot Noir or Nebbiolo (or even Gewurztraminer when I'm in the mood), but clearly I too feel very strongly about Riesling as the source of so many great wines. Germany has always been recognized as the spiritual home of Riesling and it's unlikely any country produces as many great examples. Elsewhere, the dry Rieslings from Clare Valley in Australia, with their petrol aromas and racy acidity, are remarkably striking and there are also some beautifully made examples in northern Italy, not only in the northeastern regions of Alto Adige and Friuli, but also in Piemonte (yes, Piemonte). Let's not forget Alsace, home of some of the most magnificent white wines in the world. 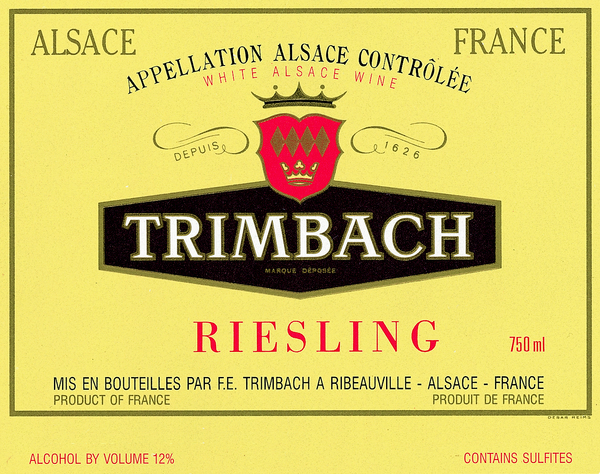 Several grapes, such as Pinot Blanc, Muscat and the aforementioned Gewurztraminer vie for top honors in any given year, but it is Riesling that more often than not is regarded as the signature grape of Alsace. This cool area, located in far northeastern France, is ideal for white wines that combine striking aromatics with excellent structure and Riesling performs magnificently here with even the most basic examples drinking well for 2-3 years with many types of foods, while the finest versions offer pleasure for a decade or more. I recently tasted four Alsatian Rieslings - three from 2011 and one from 2010 - that gave me a better understanding of the status quo of this wine in this zone. 2011 was a very warm year, delivering wines of excellent richness and quality. The acidity levels are slightly lower than in an ideal year such as 2010, so the wines may not age as long as is typical, but as with any wine from any area, one needs to look to the best producers. 2010 was a first-rate year in terms of overall balance. The Rieslings are a bit lighter on the palate than those from 2011, but the aromatics tend to offer greater complexity, while there are better levels of acidity. The 2010s as a rule will tend to age longer than the 2011s, but there are excellent wines from both vintages. 2011 Meyer-Fonné Reserve - Straw-light yellow color; expressive aromas of Bosc pear and chamomile. Medium-full, this has a rich mid-palate, very good acidity and impressive persistence. There are notes of yellow spice in the finish along with a touch of minerality. This is quite dry and has impeccable balance; it is rich with a nice sense of lightness at the same time. Enjoy over the next 2-3 years. This is not a well-known producer, but based on this wine, it should be! 2011 Domaine Weinbach "Cuvée Theo" - While Meyer-Fonné is not a household name among Alsatian producers, Domaine Weinbach, managed by Colette Faller and her daughters, is world famous. Much of this is based on their amazing quality, while some of it derives from the fact that the wines are very rich, in some cases, quite lush on the palate. This "Cuvée Theo" from 2011 is prime evidence of the house style; offering aromas of apricot, Anjou pear and hibiscus, this is very ripe and rich and comes across quite differently on the palate and in the finish than the Meyer-Fonné from the same vintage. That's not to say that one wine is better than another; rather, these two wines are meant for different food preparations, with the Meyer-Fonné arguably a better match for terrines and lighter fish, while the Weinbach seems as if it would be better paired with crab, lobster or even a lighter veal preparation. I don't see much point to aging this wine, so enjoy it now and over the next year or two with food. 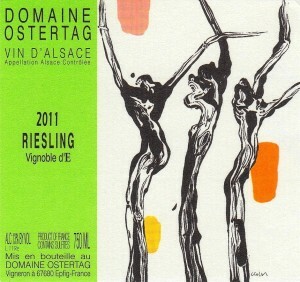 2011 Ostertag "Vignoble d'E"- The "E" in this wine's name stands for Epfig, the town around which the various vineyards that are the source of this wine are located. Offering pleasant aromas of lime, chamomile and melon, this is a distinctive wine that combines lovely varietal purity with finesse and charm. This has good natural acidity, excellent persistence and is elegantly styled. I'd love to try this wine with delicious, but uncomplicated dishes such as vegetable terrine or sautéed scallops. André Ostertag is a biodynamic producer who is at the top of his game. 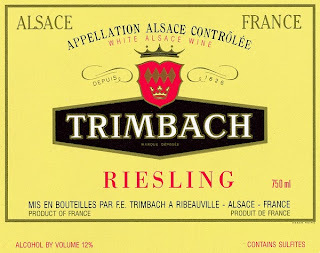 2010 Trimbach Riesling - Trimbach may be the most famous and successful wine estate in Alsace and why not? After all, they've been in business since 1626! This 2010 Riesling is a lovely wine, one that displays beautiful varietal purity and balance with a vibrant finish with lively acidity. Offering aromas and flavors of pear, melon and yellow flowers, this is medium-full with a rich mid-palate and a long finish with excellent persistence. This firm's "Cuvée Frederic Emile" Riesling is an amazing wine that has been recognized as one of Alsace's best examples of this variety, but this classic Riesling is also something very special. Enjoy this over the next 2-5 years with dishes such as pork medallions, roast veal or even Oriental cuisine. Head to Italy, especially Southern Italy, and you've got to enjoy the local pizza. Where else in the world is pizza taken so seriously - and done so magnificently? To help you on your quest to find the best pizza during your next visit to Campania, local journalist Monica Piscitelli has written a book titled Giuda alle Migliori Pizzerie Napoli e Campania. It's in Italian, but even if you don't know the language, this is an easy to navigate book that's nicely organized with beautiful graphics and easily understood ratings. Piscitelli begins her book with an engaging discussion of pizza in Napoli and how to recognize greatness in this product. She admits that personal opinion - objectivity - plays an important part in this decision. This is like enjoying wine, in that it depends on whom you're sharing your pizza with (or if you're sharing it), if you're enjoying it at a renowned pizzeria with a hungry crowd or simply eating it while working on your computer. Beauty in pizza - like most things - is in the eye of the beholder. Is it crunchy? Is it too runny? Was the best flour used? The Neapolitans do take their pizza seriously to say the least. For the author, there are some things that she needs to see and taste in a Neapolitan pizza. She writes about looking at the pizza after it has been cooked (or "fired" in the oven, if you will); this "reveals many things, not only lightness, softness (fluffiness) and uniformity, but also ... the perfect tradition of a beautifully risen pizza from the wood oven." As for the main section of the book in which she rates the various pizzerie, the author organizes these eateries into location in Napoli (such as Centro Storico e Mercato and Toledo e Quartieri Spagnoli), just outside the city as well as other areas of Campania. 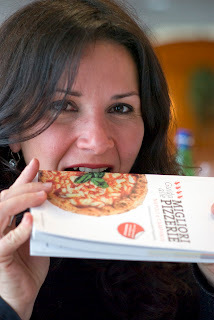 She tells the history of each pizzeria, writing about the individuals that operate them and offers tidbits, as in the section on Pizzeria del Figlio di Presidente, when they served pizza to President Bill Clinton during his visit amidst a G7 conference. But trivia aside, readers will want to know which pizzerie are the ones that Piscitelli rates the best. There are several categories including atmosphere, price and parking, but of course, everyone wants to know who serves the best pizza. Among the highest rated by the author, the list includes Starita (Via Materdei, Napoli), Umberto (Via Alabardieri, Napoli), Di Matteo (one of Napoli's most historic pizzerie and another place President Clinton stopped in) and La Notizia (Via Caravaggio, Napoli), the creation of Enzo Coccia, who has been recognized by local and international press for the quality and variety of his ingredients. There are a few others in Napoli that receive the highest rating as well as one - Pizzeria Pepe - that is situated outside of Napoli, in this case in the town of Caizzo in the northern Campanian province of Caserta. Piscitelli also has a separate rating for the best examples of Pizza Margherita, the pizza that is the truest representation of the Neapolitan style (and one that many pizza devotees judge a Campanian pizzeria on); the list includes Pizzeria Vuolo and Di Napoli in the city of Napoli as well as the previously mentioned La Notizia and Pizzeria Pepe. Finally for students of how this style of pizza is made there is a glossary of the pezzajuolo (the pizza maker) at the back of the book; terms such as crisceto (the mother yeast), impastamento (kneading) and stufa (stove) are defined. This is a nice source of information, one that helps lift this book above others written on the subject. In all, this is an engaging, informative, highly detailed look at the best pizzerie of Napoli and the surrounding area and it clearly was a labor of love for the author. Brava, Monica! Available as an app for iPhone here. 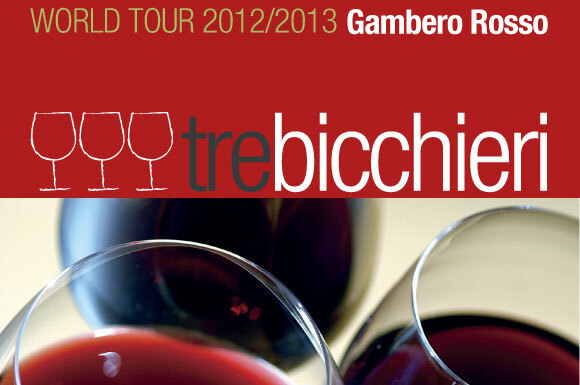 The Gambero Rosso Tre Bicchieri tasting hit Chicago yesterday and the result was a great success. This the fourth year for the tour to visit Chicago - San Francisco and New York City are the other cities on the US tour - and this year saw the largest attendance. It was extremely well received by most of the attendees I spoke with; in fact, I heard three of four of them tell their colleagues that they believe this has become the best wine event of the year in Chicago. When you consider how many wine tastings are held in Chicago every year and then consider that this is only the fourth time for this event, that's some lofty praise! For those readers who are not familiar with this event, this is put together by the famous Italian wine publication, Gambero Rosso; each year, they organize numerous tastings by their panel members who sample 20,000 wines from some 2300 Italian producers. Wines that are recommended are listed and ranked according to a glass - or bicchiere (plural, bicchieri) rating. One glass is a very fine wine, while two glasses means a very highly recommended wine, while three glasses (tre bicchieri) is an outstanding wine, one that is a great example of its type. This year for the 2013 guide, a total of 399 wines were awarded this highest rating, meaning that for 2013, just less than 2% of the total number of wines tasted were awarded tre bicchieri, meaning this award is very difficult to attain and one that is highly treasured by the wineries. What I love about the wines that receive this award is the fact that there are many, many types, from sparkling to dry whites to lighter reds to be enjoyed over their first three to five years along with full-bodied reds made for a decade or two (or three of cellaring). Thus you have sparkling wines from Prosecco and Franciacorta, lovely whites from Alto Adige, Friuli, Marche and several other regions and reds ranging from Carignano del Sulcis from Sardinia to Italy's most famous reds such as Barolo, Brunello and Amarone. Not only is there something for everyone, but it is an excellent mirror for the Italian wine industry. 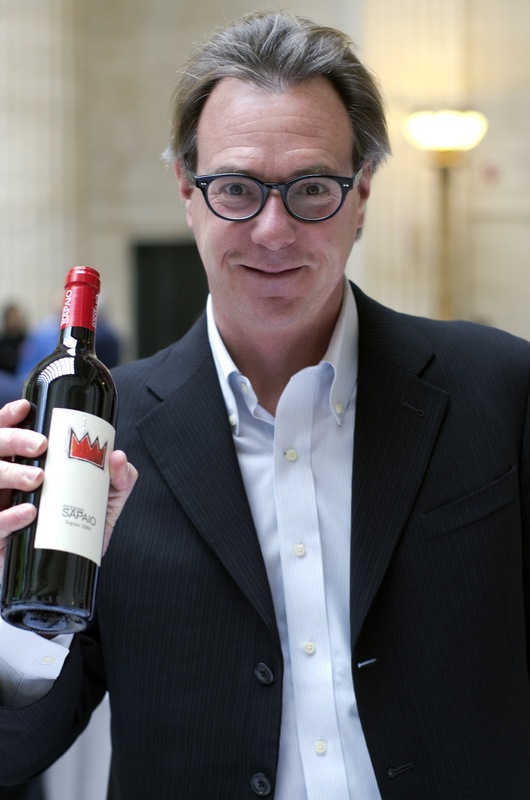 I believe that consumers in America and just about everywhere outside of Italy need to learn that Italy is not just the home of what I call "trophy" reds, wines meant to compete with the world's finest. 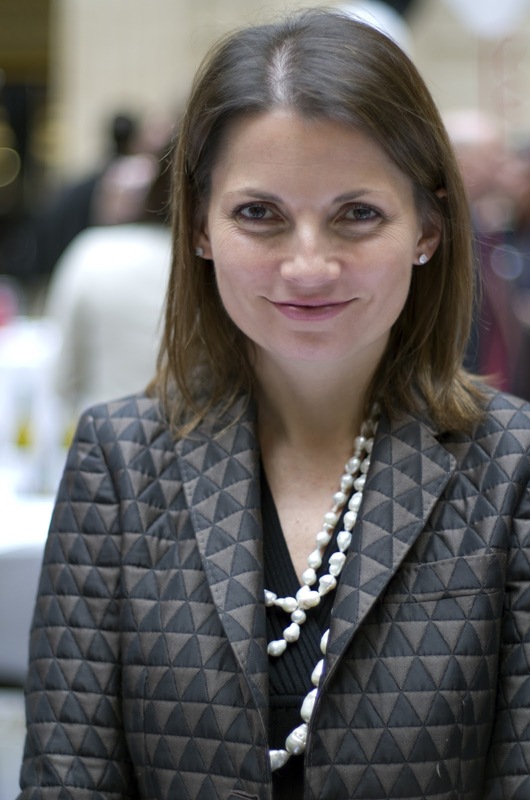 No, Italy is about lovely sparkling wines, vibrant whites wines as well as charming reds. This tasting gives you a great spectrum into what Italian wines are all about! A few highlights. For sparkling wines, there were several that I thoughts were standouts, including the 2011 Ruggeri Prosecco "Giustino B", the 2011 Merotto Prosecco "Cuvée del Fondatore" (two shining examples of how rich, complex and beautifully balanced Prosecco can be); also from Franciacorta, the first-rate 2006 Ferghettina Extra Brut, an extremely dry, beautifully balanced wine and the explosive 2004 Ca' del Bosco "Annamaria Clementi" Rosé, wine in that in my mind is one of the world's finest sparkling rosés. For whites, I loved the 2010 Monte del Fra Custoza "Ca' del Magro", one of the best examples of this Veneto white. Also impressive were the 2011 Cantine Lunae Bosoni Vermentino "Etcihetta Nera", a wine of superb richness and texture with lively acidity that has been my favorite Vermentino from Italy for the past three or four vintages. Other excellent whites included the 2011 Cantina Nals Magreid Pinot Bianco "Sirmian" that displays beautiful varietal purity with subtle spice - what a lovely wine for so many meals - and the 2010 Ettore Germano "Herzu", a dry Riesling from Piemonte - yes, you read that right! - that you have to taste to believe! Finally, just a few reds - there were so many great examples! Two beautiful versions of Carignan from Sardinia: the supple and delicious 2010 Cantina Mesa "Buio Buio" (gotta love that name) and the richly endowed and beautifully structured 2009 Agricola Punica "Barrua." There were several examples of Amarone from the stellar 2008 vintage (this is one of the finest vintages for Amarone in the last ten years); the best included the perfectly balanced Allegrini and the elegant and traditionallly styled Speri "Vigneto Sant' Urbano." From Campania, the 2007 Feudi di San Gregorio Taurasi "Montevergine" offers wonderful varietal purity, supple tannins and nicely integrated oak; this is a beautiful red meant for ten or more years of cellaring. Finally, I always love discovering new wines I haven't tasted before. This year my favorite was the 2009 Terrazza dell'Etna Etna Rosso "Cimeco", a 100% Nerello Mascalese with lovely wild strawberry and dark cherry flavors, polished tannins, very good acidity and lovely finesse; this is a fine example of what the top producers in Etna are accomplishing these days. One final note on the tasting. I overheard a restaurant owner who had come in from Milwaukee for this event telling Christine Volkmer, who handles public relations for this event, that "this is the best resource we have for Italian wines." I couldn't have said it better myself! Thanks to Christine as well as Tiina Eriksson and Lorenzo Ruggeri and their team from Gambero Rosso for their organization of this event, in which more than 110 Italian producers gather to pour their finest wines. It's a huge tasting, but it comes off beautifully and I can tell you first hand in Chicago, that each year, more members of the trade show up and are dutifully impressed. I can't wait until the 2014 tasting! The Tre Bicchieri tastings are back in America, beginning with a tasting this Thursday, the 7th in San Francisco and continuing next Tuesday, February 12 in Chicago and finishing up on Friday the 15th in New York City. 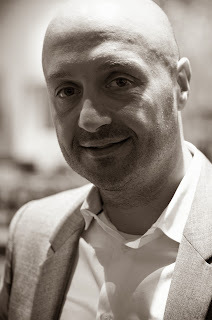 These tastings are organized by the Italian wine publication, Gambero Rosso. Each year in the fall, they publish their annual guide to that year's finest Italian wines and reward these offerings with a rating of one to three glasses (tre bicchieri). This year, 20,000 wines from 2350 producers were judged for the guide with a mere 399 being awarded the highest rating of Tre Bicchieri. This is of course a must attend event for anyone in the media or trade that works with Italian wines. What I love about the event is how comprehensive it is; if your education of Italian wines is limited to reading a few American publications, chances are you know about a few famous reds. But with this tasting, you will have the opportunity to taste a great range of the best wines of Italy and discover first-hand the marvelous array of viticultural products offered by Italy. Thus you will try examples of sparkling wine such as Prosecco and Franciacorta, outstanding whites from Alto Adige, Friuli, Liguria and other regions as well as gorgeous reds such as Barolo, Brunello, Amarone, Taurasi and Barbera, to name only a few. In each city, there will be more than 110 producers pouring their wines; each one of them earned a Tre Bicchieri rating in the 2013 guide. For a list of participating producers in each city, click on the city's name: San Francisco, Chicago, New York City. I will be attending the event in Chicago at the historic Union Station. I hope to see you there! I'll be more than happy to point out a few of my favorites. Everywhere you turn these days, there's some new forum you can peruse for wine information. There are countless blogs (good and not-so-good), there are streaming videos at YouTube or at winery websites and there are articles at online sites that sell wine. And yes, there are still books available that can provide the reader with information about a particular wine or often a large group of wines. While you should be able to trust what's written in a book (especially given the time necessary to write and edit the book as opposed to a blog that's often composed in a manner of minutes), we know that there are too many mistakes in too many wine books currently in the marketplace. So where does the average wine lover turn to for the most intelligent and insightful information on wine? 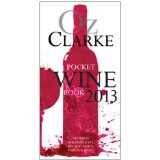 The best and easiest to understand work that I've encountered as of late is the Oz Clarke Pocket Wine Book 2013. 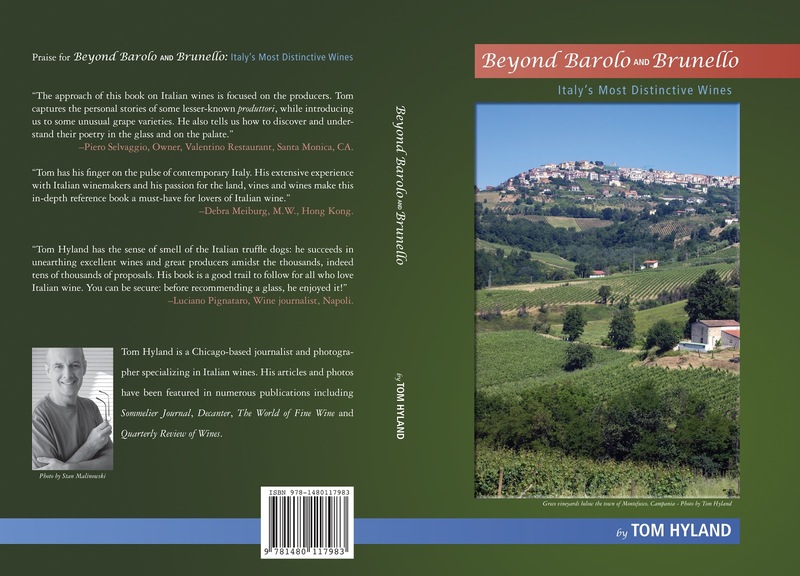 This book has been published for numerous years and it's updated for each edition (something that you would think would be the norm for a wine book, but I can tell you that it's not), so the information is quite up to date and accurate. But more than that, it's a great way to educate yourself about the world of wine and much of that is due to Clarke's manner in which he presents his material. I first met Oz about ten years ago after hearing a great deal about his knowledge regarding the wines of the world. Sometimes people in that position are a bit much to handle, as their egos constantly need to be fed. Well, that's certainly not the case with Oz, who's quite funny and has a wonderful sense of humor. He's actually a classically trained actor who performed in numerous productions of the plays of Shakespeare and he's got a great palate, as evidenced by his being the youngest ever person to win the title of "British Wine Taster of the Year," way back in 1973. Perhaps it's the various avenues that Oz has taken before winding up as a wine writer and critic, but whatever the recipe, it's been a winning one, as he has become one of the world's most respected wine personalities, all the while maintaining his humility. A few notes on the book. This is in encyclopedic format, so the entires are easy to find - they are also well organized. You'll find entries on producers (more than 4500), wine regions and grape types. A star system is used to rate various wines and for each wine highlighted, recommended vintages are listed. This last feature also deals with vintages that are meant for current consumption and those that need a bit more time in the bottle. Here's an example of the entries from just two pages under the letter "N": Napa Valley; Navarra; Navarro (the California producer as opposed to the Navarra district of Spain); Nebbiolo; Nebbiolo d'Alba; Nelson (a wine district in New Zealand); Nero d'Avola; Neuchatel; Neudorf (another wine zone in New Zealand) and New South Wales. That's a lot of ground to cover and it's only two pages from the "n" section of the book! There are some more detailed entries for famous wine zones (Napa Valley, Burgundy) as well as grape types (Cabernet Sauvignon, Sauvignon Blanc). These full-page entries are very informative, with lists of the best producers that work in these areas or with these grape types. Add to that vintage charts - both for relatively recent releases as well as older wines - and you've got quite a lot of bang for your buck. This is especially true, given the price of $14.95 ($17.95 in Canada).